Former Real Madrid player and manager Zinedine Zidane has agreed to join the club, but not right now. Santiago Solari’s Madrid lost three home games in a row, resulting in the side getting knocked out of three competitions. While mathematically, the league may still be a possibility, winning from 12 points behind Barcelona isn’t really realistic. As a result, Santiago Solari’s job hangs in the balance. Zinedine Zidane left the Madrid job last summer as he thought that he could no longer win with the team he had. Julen Lopetegui was subsequently appointed but the former Spain manager was sacked just a few months later. Santi Solari was then given the job and while his team had a sudden boost in form, all of it came crumbling down last week. As a result, the Galacticos called the former French World Cup winner to take over the reins once more at the Bernabeu. 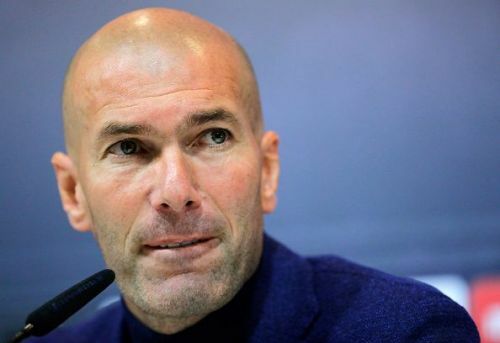 However, according to the reliable (when it comes to Madrid news) Jose Luis Sanchez, Zidane has refused to take over immediately, but instead will wait until the summer. The condition is that he will be given full control of the team to oversee a complete renovation of the squad. Jose Luis Sanchez is usually very reliable when it comes to Real Madrid news. As a result, it would be safe to assume that Madrid did call the Frenchman but whether he would actually join in the summer remains to be seen. Real Madrid have literally nothing to play for right now. They might make life harder for themselves by losing more games and putting Champions League qualification in jeopardy but that is unlikely to happen.